View from balcony of Lea Library, rare book room at Van Pelt Library, University of Pennsylvania. It’s not everyday that I get the opportunity to photograph such a unique space as a perfectly-preserved Victorian Gothic reading room embedded in the top floor of a modern library. I was delighted to be commissioned by Cathy Gontarek, art director the Pennsylvania Gazette, to illustrate an article on the gorgeous Henry Charles Lea Library at the University of Pennsylvania in Philadelphia. Link to PDF of Gazette article on Henry Charles Lea. Here is another article that features my photos about renovation of Van Pelt Library, in which Lea Library is housed. Portrait of Lea that hangs in the rare book room. 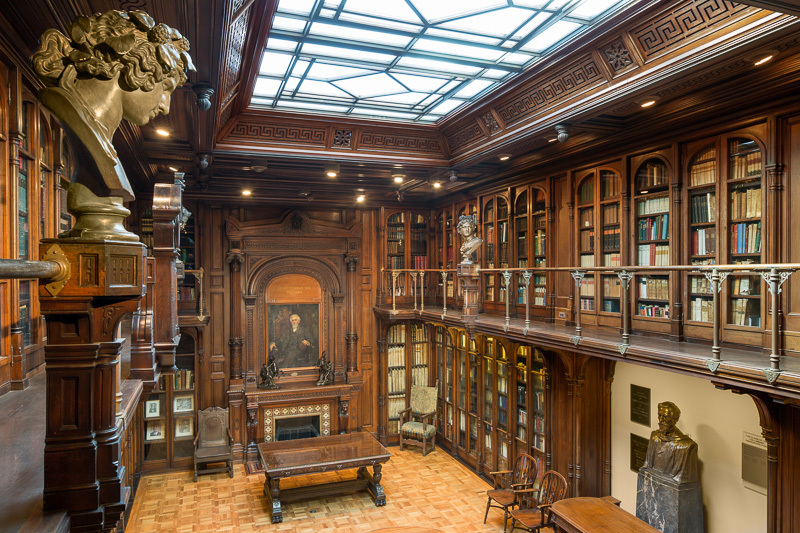 In 1925 Henry Charles Lea’s family donated his extensive collection of rare books and manuscripts to the University of Pennsylvania — along with the room in which they’d been housed since 1881. The recently-completed Lea Library is now home to the Special Collections Center and the Schoenberg Institute for Manuscript Studies, and includes conference rooms, a digital media lab, seminar rooms and exhibition space for rare manuscripts, in addition to the refurbished reading room. 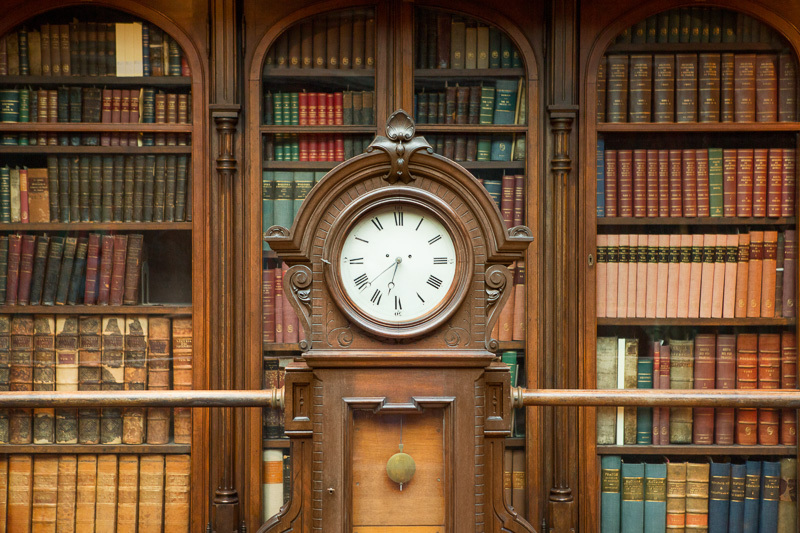 The double-height reading room is an impressive example of Victorian architecture and interior design — truly a treasure worth preserving for future generations of students and scholars. Victorian bust from original Lea Library. The shelves are filled with rare volumes. Page from a book about witchcraft from the 1400s. Central atrium of Curtis Center. The Curtis Center was built in 1910, by publishing magnate Cyrus Curtis. His publishing empire included The Saturday Evening Post and Ladies’ Home Journal. The almost one-million-square-foot building was a self-contained magazine factory. The entire process of creating a magazine – from writing and illustration to printing – took place in this building that covers an entire city block. The Curtis Center even had its own electrical generators, since public electricity was too unreliable. By the 1980s the building had deteriorated. A real estate developer decided to revitalize it, converting the central exterior space into a covered atrium with a decorative marble floor and fountain. Boardroom of Brown & Brown of Pennsylvania, LP. Today, the building combines a classic look with modern functionality. It is home to ergonomic office chairs in wood-paneled conference rooms, and MacBooks underneath hanging chandeliers. I was particularly struck by the historic wood pediment framing the doorway to one of the current tenants, the digital brand management company Brand.com. Historic wood pediment frames the doorway to the digital firm Brand.com. When the Curtis Center was renovated in 1987, I documented the renovation for the developer. Last month the building was put on the market, and I was commissioned to document it for CB Richard Ellis, the commercial real estate broker. The Curtis Center is twelve stories high and across the street from historic Independence Hall (its steeple is on the right side of this photo). Photo by Ezra Stoller. 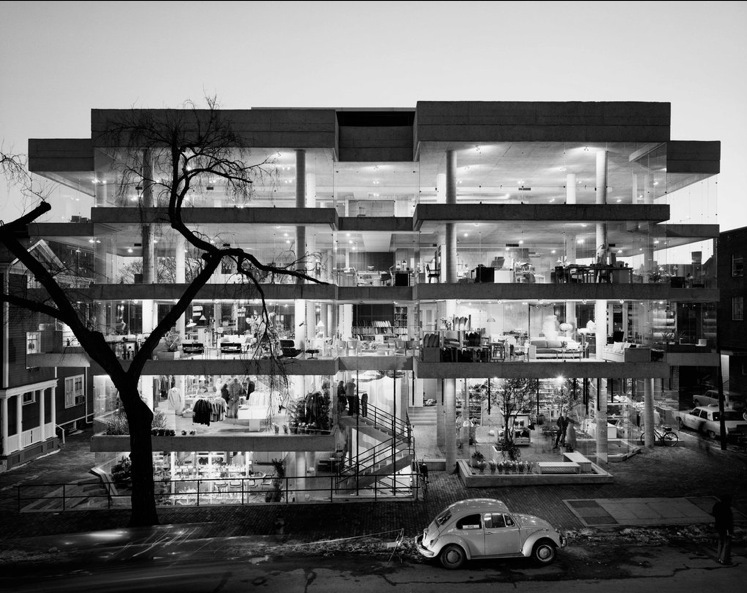 Design Research, a store in Cambridge, Mass., 1969, designed by Benjamin Thompson. 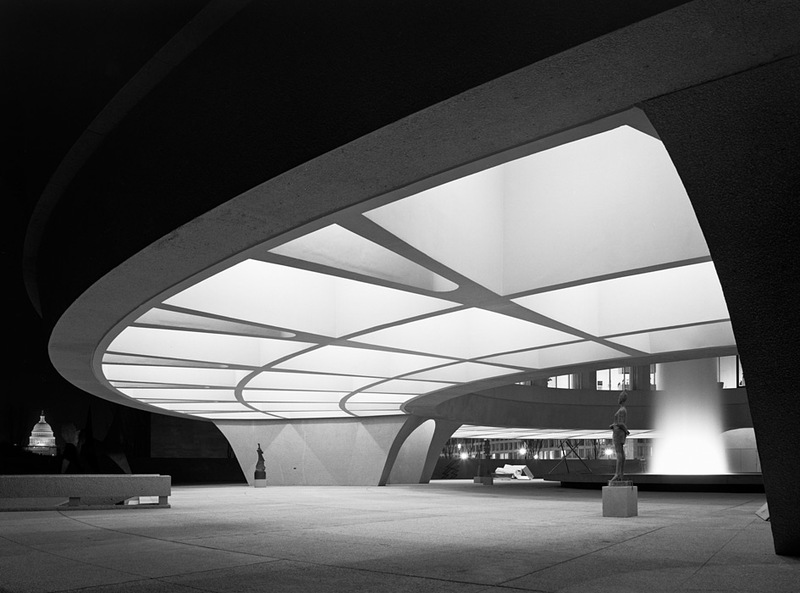 Currently there is an exhibit of the work of Ezra Stoller at the Yossi Milo Gallery in New York City. Stoller (1915-2004) was a pioneer of modern American architectural photography. He photographed for such famous architects as Frank Lloyd Wright and Erro Sarrienen. I love how the inside merges with the outside in this twilight photo. I also love how this photograph breaks some of the "rules" of quality architectural photography. There is a dead tree, a parked car and melting puddles of snow, which are all elements that shouldn't be in a "perfect" photo. These elements provide context and also make the image more real. Photo by Ezra Stoller. Hirshhorn Museum, Skidmore, Owings & Merrill, Washington, D.C.
Stoller's career aligned with the ascendancy of modernism in architecture. Grand and simple forms predominate in his tonally beautiful black & white work. You can read more in this NY Times article. At Renninger's Antiques Market in Adamstown, Pennsylvania, I purchased some old photographs from a vendor. I paid five dollars for this tintype. Once I started examining it, I wanted to know: When was this photograph taken? Who are the people in the photograph? Using the internet I have discovered the following. Gill's City Gallery was a photo studio run by William L. Gill from 1859 to 1882. The names Henry Stehman and John Stehman are written on the paper holder. The two men in the photograph certainly look like brothers. Having asked several people, the consensus is that these men are somewhere between twenty-four and twenty-eight years old. There was a Henry B. Stehman who was born in 1852 in Lancaster, Pennsylvania who went on to become a famous doctor who treated lung diseases and who founded a sanatorium in Pasadena, California. While I don't have definitive proof that the man on the left is this Henry Stehman, the other evidence supports this possibility. 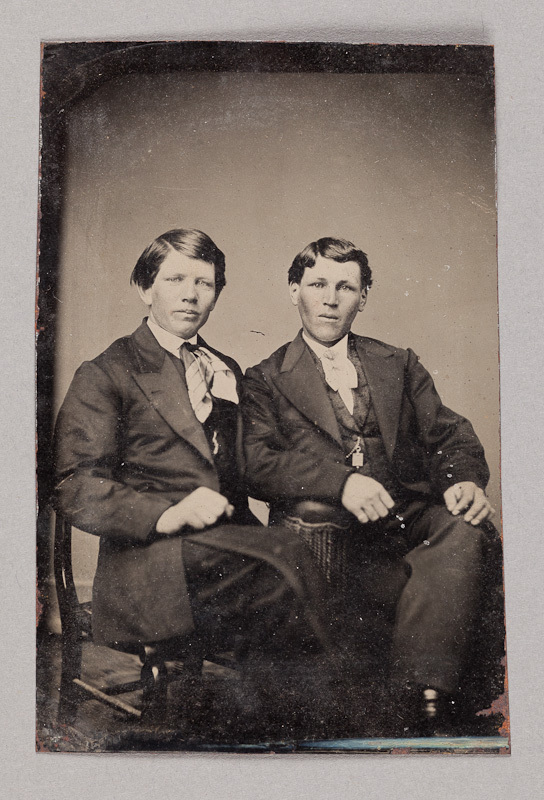 If Henry was twenty-five when the photo was taken, then the photo was taken in 1877, a date that is consistent with the years of operation of Gill's City Gallery and the use of the tintype process. Unlike many photo processes, which have a negative and can easily produce multiple copies, tintypes are one-of-a-kind. Often a multiple lens camera was used to simultaneously take four images onto one metal plate. The developed image was then cut with tinsnips into four separate photos, hence the name "tintype". With a black border on the left and top, the Stehman portrait looks like the upper left corner of a larger plate that was imprecisely snipped from the larger sheet. A photograph has an uncanny ability to capture personality and detail whether it's a tintype from the 1870s or a digital image from 2011. This morning I have pondered this quote and looked at many images by Frank and Cartier-Bresson with the intent of pairing their images to show Cartier-Bresson's strong composition and lack of compassion and Frank's indifference to composition and his empathy with his subjects' emotions. The reality of their work is that it is complicated. In comparing Cartier-Bresson's photo of Georgians on a picnic at a monastery with Frank's image of an African-American funeral I am struck by how strong the composition and arrangements of forms is in both images. Yes the placement of every element: the monastery in the distance, the rake of the car fender, the placing of each of the people, even the picnic blanket all fall into place, as if sketched by a painter instead of aligned by a photographer. The funeral photo has its own pictorial structure with three figures receding in space. On the question of empathy, the picnickers appear a bit nervous and dwarfed by the landscape. While the foreground mourner is lost in his thoughts and to me almost seems to be playing a harmonica. Trying to determine who the most compassionate photographer presents one of the dilemmas of photography--how accurately does our reading of a photograph reflect the reality of the emotion state of the people in it. 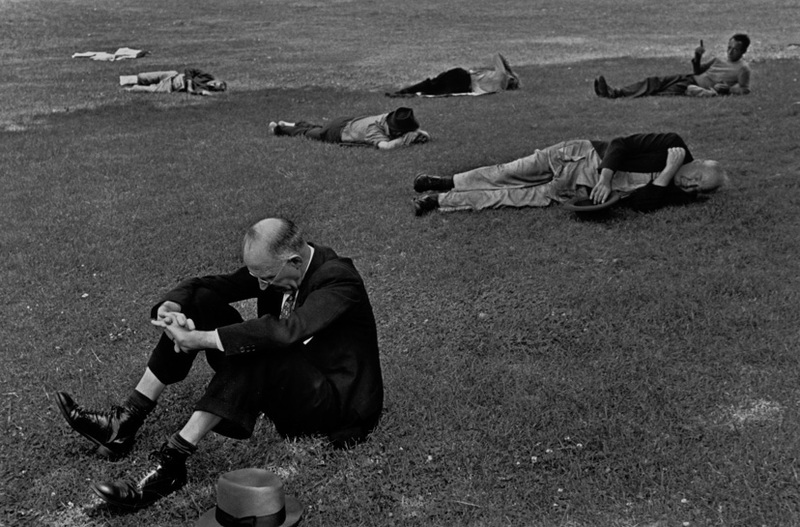 Another pair of Frank and Cartier-Bresson images of people lying in parks shows Cartier-Bresson's focus on people arranged in the picture plane and Frank's direct confrontation of a man lying shoeless on the ground. As to which photo displays its subjects' emotions more strongly, I'm not really sure. And consider this photograph of a shoeless New Yorker. Was it shot by Frank or Cartier-Bresson? 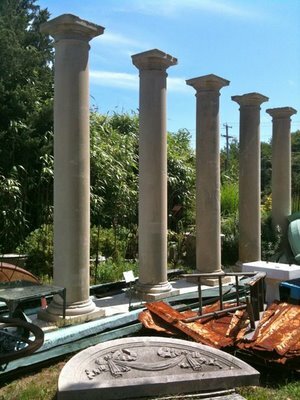 Two weekends ago while visiting friends at the New Jersey shore, my wife and I paid a visit to an architectural salvage yard, called Recycling the Past, located in Barnegat, NJ. Their enormous lot is a treasure trove of building pieces. As a fan of buildings I was in heaven. There are Victorian mantelpieces, signs from 1950s amusement parks, terra cotta decoration from 1920s buildings, 15-foot stone columns from a closed state mental hospital and on and on. Recycling is in vogue. We recycle cans, paper and glass at curbside to minimize trash put into landfills. The reason to recycle buildings is more complex. In America buildings often have short life spans. A thirty-year baseball stadium is obsolete, whereas in southern France I visited a Roman stadium 2000 years old that is still used for bullfights and rock concerts. When a house or commercial building is deemed too expensive to renovate or unsuited to its site's next use, then it's knocked down. 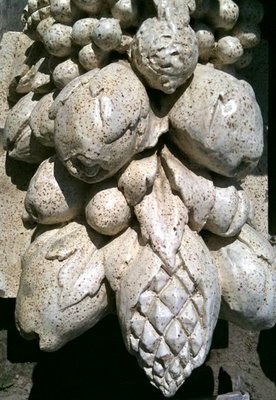 Pre-World War II buildings often have a level of craftsmanship and quality of materials that current buildings frequently lack. This makes the well-crafted fragments of older buildings valuable to buyers who can appreciate and afford them. My emotions ranged from delight and wonder at seeing beautiful salvaged objects that may find new homes to sadness and melancholy contemplating the decay and destruction that led to these objects being orphaned from their original settings. Enough claw footed bathtubs to shoot lots of Cialis TV ads. 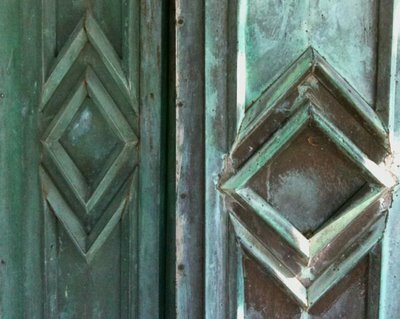 Detail of copper panels from an old Atlantic City school.
. This book of Frank's black & white photographs of America has been one of my favorite photo books since I first saw it in the late 1970s. Casual and seemingly off hand, the photographs in The Americans paint a portrait of America in the 1950s vastly different than the sanitized image of the country portrayed in Life magazine and Saturday Evening Post. As a European outsider, Frank explored aspects of American culture that are not its best side--the racial divide between blacks and whites, the lonely interiors of bars, the sadness of the wrong side of the tracks. For me some of the revelations of the exhibit at the National Gallery include seeing contact sheet and work prints of images that never made it into the final book. Frank shot 27,000 images in 35mm black & white on his various trips around the US in 1955 and 1956. He made rough prints of about 1,000 of those and ultimately pruned those down to 83 images. It fascinated me to see many strong images that never made the final cut. The beauty and poetry of the book is the sum of all of the images rather than the heroics of any one specific image. There is a rhythm to the sequence of images in the book. Frank documented America's obsession with cars, the ubiquitous presence of American flags, and the despair and mystery of funerals, gas stations, diners and jukeboxes. Another revelation to me was seeing the cover of the original published version of the book. Unable to find an American publisher willing to publish the book, Frank found a French publisher who issued the book in 1958. Copies of that version were on display. The cover features light blue graph paper representing a modern building coupled with a whimsical ink drawing of a sidewalk, pedestrians, a street lamp and an awning in a style similar to Saul Steinberg's New Yorker illustrations in the 1960s. This cover is bizarre because it is so different and disconnected from the dark and brooding photographs within. , and a friend of Frank's sums up, "Anybody doesnt like these pitchers dont like potry, see? 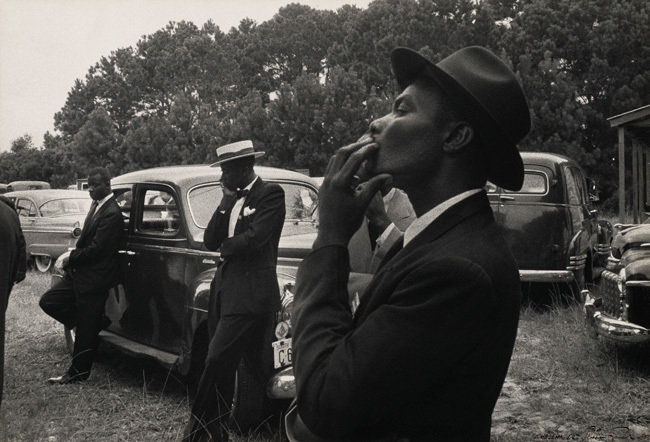 ....To Robert Frank I now give this message: You got eyes."